Background and objective: Having a sibling who suffers from an eating disorder (ED) has a profound effect on healthy siblings’ own health, quality of life and family relationships, yet siblings have been an excluded group within health care, and there is a lack of knowledge regarding healthy siblings’ needs and wishes for information and support. Thus, the aim of this study was to examine adolescents’ experiences of living with a sibling who suffers from an ED. Method: In this small-scale pilot study, three boys and two girls aged 15–20 years were interviewed, and the interviews were analyzed by qualitative content analysis. Results: This study confirms prior knowledge of adolescents’ experiences of living with a sibling who is suffering from an ED. The adolescents were concerned about their siblings and lacked information about their siblings’ illness and treatment progress. The girls described that their everyday life had been heavily influenced by their sisters’ illness, while the boys described that their everyday life with friends and activities were not affected to such a great extent. One new result that emerged as something positive was that some informants described that although the ED was a source of conflict in the family, it had led to greater awareness of the importance of gaining sufficient energy and had contributed to better meal situations in the family. Conclusion: Having a sibling with an ED had a profound and negative effect on family relationships, and was often a source of conflict, especially around mealtime. However, it appeared that if parents were able to organize family meals and create an open and supportive climate, the negative effects for the family could be reduced. The health care professionals need to acknowledge the siblings’ need for information and support, and support parents in their important role of caring for well siblings. Thus, having a sibling who suffers from an ED affects the everyday life of adolescents in many ways. Yet, we lack knowledge about how the healthy siblings experience their situation, and their need for guidance and support. Against this background, the aim of the present study was to examine adolescents’ experiences of living with a sibling who suffers from an ED. All informants and their parents provided informed written consent. Before the inclusion started, the study was ethically approved by the review board at St Lukas institution of psychotherapy at Ersta Sköndal college. Recruitment of participants took place in a specialist treatment unit, where both authors are employed. Approximately 20 families were asked by care staff at the unit to distribute an information letter to healthy siblings aged 13–20 years living at home. The therapists informed both the parents and the sick adolescents during a family session, and gave them a letter to pass on to the sibling. Siblings who wished to take part contacted the interviewer to arrange a time and place for the interview. Patients were excluded if they were treated by one of the researchers. Some of the patients did not want their siblings to receive information about the study, and some parents stated that the healthy sibling was unaware of the ED or that they did not talk about it and that the siblings’ life was not affected. These families did not want to ask the healthy sibling to participate, as they believed that it would only give rise to worry. Some 8–10 families took the letter home to share with the healthy sibling; and five adolescents (two girls and three boys) contacted the researcher to arrange for an interview. The interview guide was sent to the adolescents two weeks before the interview to make it possible for them to prepare themselves. They were also informed that they were free to contact the researcher should they have any questions. The interviews were carried out during February and March 2013. Five interviews were conducted with adolescents aged 15–20 years, three boys and two girls, all of whom had a sister undergoing treatment for ED. Four of the interviews took place at the ED unit, while one adolescent wished to be interviewed over the telephone. The interviews lasted for 40–50 minutes, were audiotaped and transcribed verbatim. The adolescents were given the opportunity to narrate freely around each topic, and the interviewer posed follow-up questions in order to obtain more in-depth information. The interviews were analyzed by conventional content analysis.17 The interview texts were first read several times in order to obtain a general impression of the whole material. Then important statements were marked in order to capture the meaning of thoughts and impressions. Both researchers independently read and marked important statements, and these were then discussed in a process of negotiated consensus until an agreement was reached. Since the aim of the study was descriptive, the analysis was conducted on a manifest level. Data with the same meaning were then grouped into codes and domains based on the aim of the study. The two researchers undertook this step together. Six main categories emerged based on 16 subcategories. The subcategories are presented within quotes in the text. The names used in the “Results” section are fictitious (Table 1). The adolescent’s feelings toward the ill sibling were mainly characterized by “worry”. The adolescents also described “feelings of anger and irritation” about their sisters’ behavior, and that they did not perceive that she wanted or tried to recover. While some adolescents contained their anger within themselves, others reported expressing their anger directly toward their sister. “Sorrow related to the ill sibling as well as oneself” was also evident. Also here, the extent to which the siblings revealed their sorrow to their ill sister differed. One adolescent described that she was able to talk to her sister about feeling sad and that they shared their sorrow. Sorrow could also be about feelings of sadness and disappointment for oneself, for example, due to perceiving being disregarded, as the sister’s needs and wishes were paramount. “Feelings of shame” emerged in two interviews. The adolescents described finding it embarrassing and shameful that others knew about it or could see that their sister is suffering from ED. They did not want others to know about or notice it. “Joy at being closer” emerged in two of the interviews. One of the participants described that due to the illness she and her sister took greater care of each other and spent more time together. All five participants reported noticing that their ill sister’s behavior had changed after the onset of ED. One subcategory comprises “changes directly linked to ED symptoms,” such as reduced food intake and vomiting after meals. Sometimes, the sibling was the first to notice these changes, after which she/he told the parents, while in other cases it was the parents who informed the sibling. The adolescents also narrated that “mental changes” such as anger, sadness and lack of energy became apparent to them in connection with their sister becoming ill with ED. One sibling also mentioned self-harm. None of the siblings perceived that their sister’s illness had affected their “own body image.” Two of the brothers who participated did not consider that their sister’s illness had influenced their perception of their own body, while the other three adolescents stated that their body image was not affected, although admitting that they compared themselves with their sister. Three of the adolescents stated that their sister’s illness had led to “greater awareness of the significance of food” as well as the importance of food for gaining sufficient energy to do things. Two adolescents revealed that the family’s eating habits had improved and become more regular due to their sister’s illness, resulting in being able to do more at school. The adolescents described the importance of “having friends to talk to.” Four of them described having talked to their friends about their sister’s illness. One adolescent narrated that a way of taking care of herself was by talking with her parents about things that she experienced as difficult. However, the others avoided talking to their parents about their worries, and none of them had sought support from student care, the youth center or similar, although some of them felt that it might be beneficial. Both sisters described finding it difficult to bring their friends home due to their ill sister’s behavior. All five adolescents were of the opinion that their families were constantly affected and restricted by their sister’s ED. A common thread in their narratives was that “everyday life is dominated by mealtimes” and that both mealtimes and the food served had changed. This limited the family’s possibility to travel and have a nice time doing pleasant things together. The adolescents also reported that “experiencing arguments and conflicts” at mealtimes was a strain. Two of the adolescents (both girls) perceived that they took greater responsibility for their parents by “helping out at home” more than previously. Two of the adolescents described “feeling excluded” by their family. Two of the brothers who were interviewed reported “not wishing to be involved” in the care of their sister. The remaining three adolescents expressed “wishing to be involved and informed.” One of them described how the staff did not want her to be involved in her sister’s care. One sister stated that in her view, the care unit should provide an opportunity for siblings to attend support meetings and leave it up to them to decide whether or not they wanted to go. There were differences in the way that sisters and brothers were affected by having a sibling who suffered from ED. Owing to the small number of participants in this study, no conclusions can be drawn, but an interesting observation is that sisters appeared to be more emotionally and practically involved in their sister’s ED than brothers. This was also found in the study by Garley and Johnson.6 The sisters described that their everyday life was affected by the fact that they helped out more at home. They also assumed responsibility for supporting their ill sister by abstaining from seeing their friends in order to stay at home with her. The girls wished for greater involvement in their sister’s treatment and to receive more information about the illness. Neither of the boys felt that their everyday life had been affected, nor did they wish to be involved in their sister’s treatment to any great extent. Garley and Johnson6 suggest that cultural norms may place a heavier carrying burden on sisters since women have traditionally assumed caretaking roles. Some studies have suggested that having a sibling with an ED might be a risk factor for developing an ED, but the findings are contradictory.13 In a study that investigated disturbed eating behavior and associated psychological characteristics in ED patients, their healthy siblings and a control group, the siblings did not differ from healthy controls.19 In another study of female ED patients and their siblings, there was no evidence of any body image disturbances among the siblings. In a study that compared body image in female ED patients and their siblings, there was no evidence of any body image disturbances among the siblings.20 None of the adolescents in our study perceived that their sister’s illness had negatively influenced their body image. As a matter of fact, three of the adolescents described that although the ED was a source of conflict in the family, their sister’s illness had led to greater awareness of the importance of eating to gain sufficient energy to do things, and two brothers reported that the family mealtime routines had improved, in turn leading to positive effects for them. This is a finding not previously reported. Previous research has shown that participation in family meals is protective against dieting and unhealthy weight control behaviors even after controlling for atmosphere at family meals.21 Thus, family meals seem to have a supportive effect, even though there may be some conflicts. This highlights the importance of supporting parents in dealing with mealtimes as well as making them aware that structured mealtimes will benefit all family members. The sibling’s frustration can be reduced by creating awareness that these changes can be positive for all the family members. In a previous interview study, younger sisters of adolescents with anorexia expressed a negative attitude toward dieting.5 These results might indicate that growing up with a sibling who suffers from an ED might actually provide an opportunity for health literacy. This has previously been reported among siblings of patients with chronic illness.16 A better understanding of how the ED affects the healthy sibling may decrease parents’ feelings of guilt and fear that the healthy siblings will be affected. The interviewed adolescents exhibited different views of whether or not they wished to be involved in the treatment. Several studies have emphasized the importance of involving healthy siblings in treatment of adolescent ED,7,8,11,14 and in family-based treatment, siblings are an important and integral part of the treatment.15 However, siblings have often been described as being reluctant to take part in family therapy.11 Perhaps this aversion is based on a fear that involvement in the treatment will increase siblings’ caretaking responsibilities. It is therefore important that siblings as well as parents are clearly informed about the rationale for sibling participation and that the siblings are not supposed to take on a parental role. It has previously been suggested that the relationship between the siblings before the onset of the illness is important to take into account when involving healthy siblings in the treatment, and that there is insufficient knowledge of how the healthy sibling is affected by being involved in the treatment.11 A close relationship between the siblings enhances the healthy sibling’s wish and need to be more involved in what is happening to her/his ill sibling. It is essential that involvement in treatment is based on the sibling’s own wish to participate. This makes it important to raise the question with the family in order to understand what the relationship between the siblings is likely to be and how it was previously. For example, a way of ensuring that siblings have the opportunity to express their wishes is routinely inviting them when a family member is starting treatment for ED in order to provide them with information and ask whether they need some support. A limitation of the study is the small number of participants and that saturation of the data was not reached. Thus, it is likely that more interviews would have added to the results, and allowed for a deeper interpretation of some results. For example, the two sisters seemed to be more affected by their sister’s ED compared to the three brothers. However, the two sisters also elaborated more on their answers in general, compared to the three brothers and the overrepresentation of the voices of Anna and Eva may bias the results. More interviews may have made it possible to get a deeper understanding of the gender differences. Another limitation is the inclusion procedure, where the healthy siblings were invited to participate in the study by their family members who took part in the treatment. In this way, the selection procedure favored those families in which there was a certain openness in relation to ED. Despite these limitations, we believe the results of this study confirm those reported by previous research in the field, as well as present some new findings to explore further in quantitative studies. Especially, the findings that the sisters seemed more emotionally affected by their sister’s ED and that the ED affected their everyday life more compared to the brothers need to be explored in a larger quantitative study including sisters and brothers of female and male patients. The finding that some of the adolescents described that the ED had led to greater awareness of the importance of gaining sufficient energy and had contributed to better meal situations in the family is also important to investigate further. Abrams MS. The well sibling: challenges and possibilities. Am J Psychother. 2009;63(4):305–317. Dunn J. State of the art: siblings. The Psychologist. 2000;13(5):244–249. White L. Sibling relationships over the life course: a panel analysis. J Marriage Fam. 2001;63(2):555–568. Halvorsen I, Ro O, Heyerdahl S. Nine-year follow-up of girls with anorexia nervosa and their siblings: retrospective perceptions of parental bonding and the influence of illness on their everyday life. Eur Eat Disord Rev. 2013;21(1):20–27. Latzer Y, Ben-Ari A, Galimidi N. Anorexia nervosa and the family: effects on younger sisters to anorexia nervosa patients. Int J Adolesc Med Health. 2002;14(4):275–281. Garley D, Johnson B. Siblings and eating disorders: a phenomenological perspective. J Psychiatr Ment Health Nurs. 1994;1(3):157–164. Areemit RS, Katzman DK, Pinhas L, Kaufman ME. 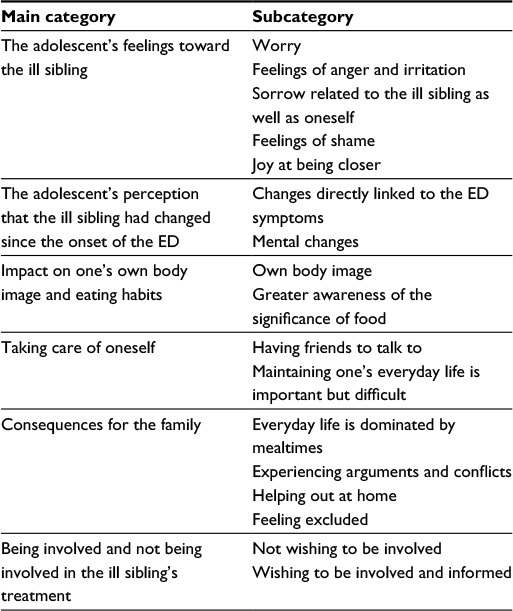 The experience of siblings of adolescents with eating disorders. J Adolesc Health. 2010;46(6):569–576. Dimitropoulos G, Freeman VE, Bellai K, Olmsted M. Inpatients with severe anorexia nervosa and their siblings: non-shared experiences and family functioning. Eur Eat Disord Rev. 2013;21(4):284293. Dimitropoulos G, Klopfer K, Lazar L, Schacter R. Caring for a sibling with anorexia nervosa: a qualitative study. Eur Eat Disord Rev. 2009;17(5):350–365. Latzer Y, Katz R, Berger K. Psychological distress among sisters of young females with eating disorders: the role of negative sibling relationships and sense of coherence. J Fam Issues. 2015;36(5):626–646. Honey A, Clarke S, Halse C, Kohn M, Madden S. The influence of siblings on the experience of anorexia nervosa for adolescent girls. Eur Eat Disord Rev. 2006;14(5):315–322. Whitney J, Murray J, Gavan K, Todd G, Whitaker W, Treasure J. Experience of caring for someone with anorexia nervosa: qualitative study. Br J Psychiatry. 2005;187:444–449. Vandereycken W, Van Vreckem E. Siblings of patients with an eating disorder. Int J Eat Disord. 1992;12(3):273–280. Honey A, Halse C. Looking after well siblings of adolescent girls with anorexia: an important parental role. Child Care Health Dev. 2007;33(1):52–58. Lock J, Le Grange D. Treatment Manual for Anorexia Nervosa. A Family Based Approach. 2nd ed. The Guilford Press: London; 2012. Fleary SA, Heffer RW. Impact of growing up with a chronically ill sibling on well siblings’ late adolescent functioning. ISRN Family Med. 2013;2013:737356. Hsieh HF, Shannon SE. Three approaches to qualitative content analysis. Qual Health Res. 2005;15(9):1277–1288. Lindstedt K, Neander K, Kjellin L, Gustafsson SA. Being me and being us – adolescents’ experiences of treatment for eating disorders. J Eat Disord. 2015;3:9. Wunderlich U, Gerlinghoff M, Backmund H. Eating disturbances in siblings of patients with eating disorders. Eat Weight Disord. 2004;9(4):258–263. 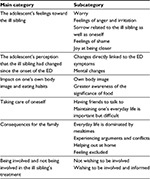 Benninghoven D, Tetsch N, Jantschek G. Patients with eating disorders and their siblings. An investigation of body image perceptions. Eur Child Adolesc Psychiatry. 2008;17(2):118–126. Loth K, Wall M, Choi CW, et al. Family meals and disordered eating in adolescents: are the benefits the same for everyone? Int J Eat Disord. 2015;48(1):100–110.